HONG KONG: In China, the smartphone battle used to be Samsung versus Apple. But not anymore. Over the summer, a Chinese company, Xiaomi, took the No. 1 position in China's competitive market and became the world's third-largest phone-maker in the process. Founded in 2010 as a lean startup to sell smartly designed phones at cheap prices over the Internet, Xiaomi was decidedly late to the game. Its first handset came out around the time of the iPhone 4S. But a clever social media strategy and a business plan that emphasized selling services that work on the phone helped Xiaomi build frenzied support from young and trendy Chinese. With people in China expected to buy 500 million smartphones in 2015 - more than three times as many as will be sold in the United States, according to the research firm IDC - Xiaomi is poised to cement its place as one of the most powerful phone-makers in the world's most important market. Now the company's founders, who include the Chinese entrepreneur Li Jun and the former Google executive Lin Bin, hope that status will help them take their brand globally. Though Xiaomi already sells internationally, next year will be the true test of whether it can continue its rise beyond China. Shunning markets like the U.S. and Europe, Lei and Lin are looking at huge developing countries like Brazil and India. And they hope to use e-commerce networks to sell cheap, high-quality phones and recreate their Chinese success. But there are considerable challenges. Xiaomi does not yet have much of a patent portfolio, leaving it vulnerable to lawsuits from competitors. Last week, the company was temporarily blocked from India because of a patent complaint by the Swedish telecommunications manufacturer Ericsson. And other low-cost manufacturers from China have the same idea about pushing into those emerging markets. "Selling the phone to users is a good start, but it's really not the end of the business," Lin said in a recent interview. "It's actually the beginning of the business. It's after the user buys the phone and starts using the phone that will generate extra value, to users and to us." 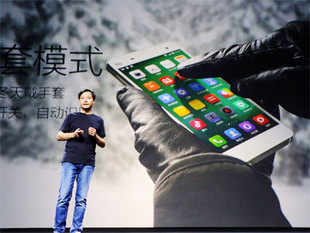 Striking similarities between Xiaomi's well-attended product unveiling ceremonies and Apple's tightly choreographed media events have meant that Xiaomi is often described as the Apple of China - largely successful because, some experts say, it produces cheap knockoffs of Apple's and Samsung's high-end phones. Yet the company is more than a copycat. In its business model and marketing, Xiaomi has out-innovated all comers in China. The online-first approach has earned Xiaomi the greatest accolade a company can receive in China: Its rivals are now copying it. The well-known telecommunications equipment makers Huawei and ZTE both have lines of phones they sell primarily online. Companies like OnePlus and Smartisan also focus on well-designed products with high-end components and sell them at a relatively low price. That imitation could prove dangerous. Analysts point out that Huawei and Lenovo can use their control of the manufacturing of parts that go into a phone to gain a cost advantage. And hipness is hard to maintain. The head of Smartisan, Luo Yonghao, for example, has made a name for his company with product announcements that resemble stand-up comedy routines. The events are so popular, the company charges admission. To be sure, Xiaomi is treated with respect by its competitors. Li Nan, vice president of the rival Meizu, which began in the early 2000s by making digital music players and aims at customers slightly older and wealthier than Xiaomi's, likens the devotion of Xiaomi supporters to a religion. "Xiaomi fans have a high level of organization," he said. "They love Xiaomi. It's a form of idolatry."